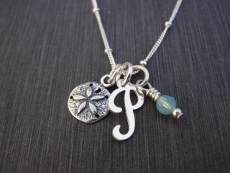 A sterling silver scroll initial with a favorite charm and a birthstone bead. 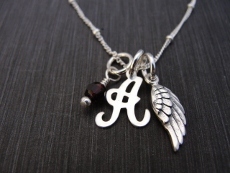 Charms are hung from sterling silver "satelite" ball and link chain which comes in 16" and 18". To order this item, please select a style, initial , charm, and bead. Then click Add to Shopping Cart button. HIp Tip: This necklace makes the perfect gift for any young girl.